Tonight Brangien and I are attending The Have and the Have Nots at the Hugo House. I was lucky enough to help David Nixon work on the tunes for his 3 videos that will show tonight as part of this series. I’m especially excited to see the music paired with the video of which I’ve only caught early glimpses. David’s songs are very personal, wonderfully sad and … short. I love short songs! The 10 songs that comprise the second video section have a total length of 11:30 (one song called “Wealth”clocks in at a whopping 19 seconds!). The theme of haves and have nots got me thinking about how we worked on this music together. Collaborating went something like this: a musical file from David would appear on my computer via the magic of Dropbox. I would open it. 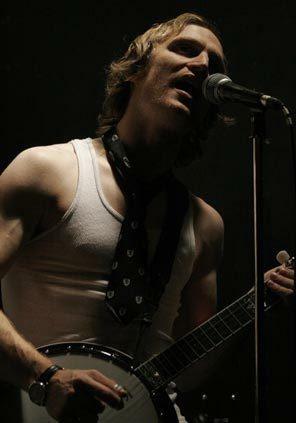 There I would always find David’s vocal and maybe some banjo or keyboards tucked into a Garageband session file. I would add some more music to it (drums, piano, bass, guitar, backing vocals), beam it back for David’s review and more music-adding. Then I mixed it all together. Some would call this the role of Producer, but the lines weren’t that distinct in our case. We never played music physically together or talked much about the tunes other than by adding to the composition. I’ve never worked like this before, but I have to say that if this is the future of music making, sign me up! It was fun, creative and had an exciting feeling similar to writing and receiving hand written letters back in the olden days. I never imagined writing tunes with so little physical musical interaction or direct communication, but the experiment worked in this case. David’s tunes are fantastic (and, yes, they’re lovingly sad). Congrats, Mr. Nixon, you’ve made some great music. And thank you to the people that created Garageband. I know you’re probably referred to as a “product team” and have meetings about features and market share and such … but you should know that there are many formerly “have nots” out here in the world who love the simple tools you’ve created that allow us to have music. At our wedding (coming up on two years ago), Brangien and I asked that people not give us any gifts. Our reasoning was that we had two houses full of stuff and we were moving into one house and more stuff was counter-productive to our goal of combining our stuff. Our mantra was something like, “your presence is your present.” The truth can be corny, but now we find ourselves happily settled and “unstuffed”. Somewhat surprisingly, most people played by this rule. However, a few rule breakers gave us great, unexpected gifts. One gift came in the form of a note from Brangien’s Aunt Candida and Cousin Walker, offering us a canoe. Earlier in the year Brangien’s Uncle Cary died in an accident at his new home in Montana. Cary was a lover of the outdoors and a fantastic guy by all accounts (he and I never met). Candida and Walker’s note still sits on our desk, telling us that Cary’s beloved canoe awaits us at a neighbor’s houses in Stevensville, Montana (near Missoula), for when we have time to pick it up. This past weekend we attended Bruce’s retirement in LA (that’s Brangien’s dad and Cary’s brother). Bruce said something to me about how all the digital photos that we take tend to disappear and never get viewed. Printed photos, on the other hand, had a way of ending up in photo albums that sat on tables and, over the years, were revisited and enjoyed. 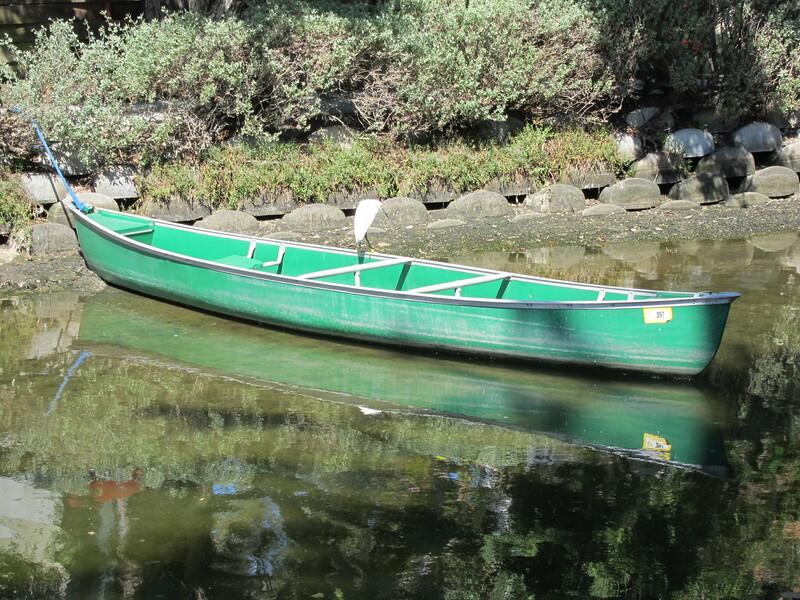 That got me to thinking about the canoe, which until now has been a bit of an abstraction, like a digital photo that someone snaps at a family event, shows you on a tiny screen, but which then travels off into the ether never to be seen again. 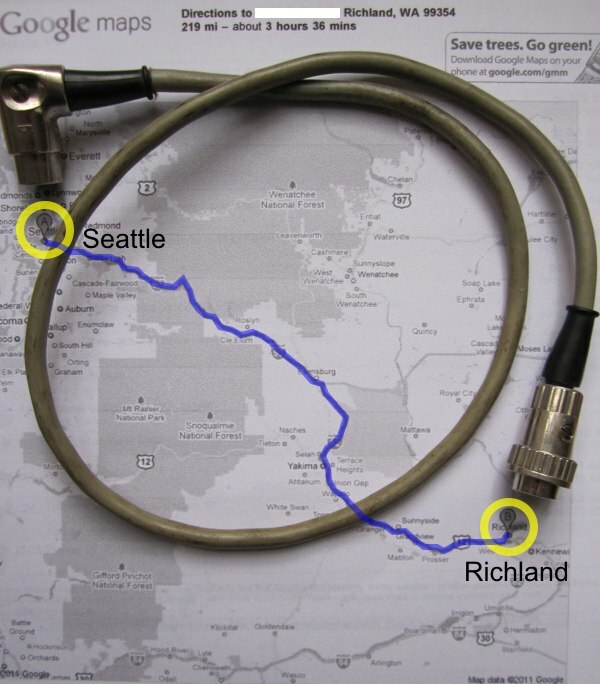 So, before Cary’s canoe pixelates any further in my brain I figure I’ll try to complete its trip from Montana to Washington. 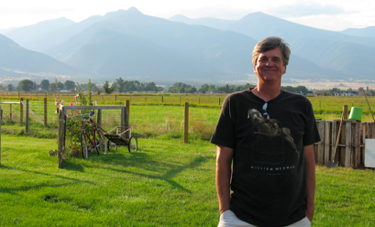 Cary at his home in Montana. On Saturday night Davis and Thaddeus ran into Choklate. She showed up on Sunday to “hang out”, which is coded musician-speak for wanting to record but only if the recorded material isn’t awful. Choklate ended up singing on two tracks (hooray! ), one of which we invented in one take with vocals and piano, as she fortuitously captured it on video with her iPhone. We turned around and recorded it for real. In other audio nerd news, I invested in a Roland octa-capture (who names these things?!) to enable the recording of drums in the basement. Hopefully I can replace drums on stuff I initially set-up in Garageband. Speaking of which, I have no idea where to take the following idea. I’m trying to use less reverb and delay in my mixes (drums, bass and vocals are dry in this example). Email me and I’ll send you the GB session to play around with if you’re interested. P.S. here’s Ali’s 40th B-day song that pitted husband against wife in a battle of music/editorial control—end result, we both won. A busy month of music making—during which I revisited the joy of Garageband. The theme this month is “found audio”. In most cases I sliced and diced audio that was sent to me or I stumbled upon, added drum loops and played along with synth and piano. Last Friday I loaded my 1974 88-key Fender Rhodes electric piano into the van on a road trip to Richland, WA for a complete tune-up and restoration with the Rhodes Scholar himself, David Ell. To borrow a phrase from him, this is intended to be my “forever Rhodes” and I want to do it up right. My roll top cover is scratched up something fierce. The rubber hammer points need some work and this 88 has been hauled around a lot, so there are some harp adjustments to be made. The speakercab is in particularly rough shape. 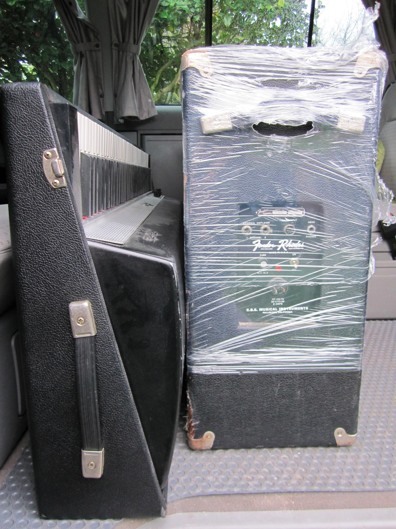 It needs new tolex, grill cloth, external hardware and general attention to detail that is beyond my pay grade. To top it off, a fully intact “EightyEight” nameplate (mine, like so many others, reads “EightyEigh”). In 2006 I considered getting rid of this Rhodes. Thankfully I repressed my inner purger and held on to it. It’s already a special Rhodes (the keys have been counterbalanced) and it should sing when David is done with it. I’ve owned a Nord Stage since they arrived on the scene and love it. I have no desire to haul this 88 to club or studio gigs, but there really is something special about the feel and sound of a real Rhodes. I’ve used a fake Rhodes on the last three or so albums I’ve recorded and I’m not sure that I can tell the difference when it’s buried in a mix. Well, maybe I can, but played by itself there are all sorts of personality traits that are lost in translation. I can’t wait to place my fully restored forever Rhodes in the basement studio. 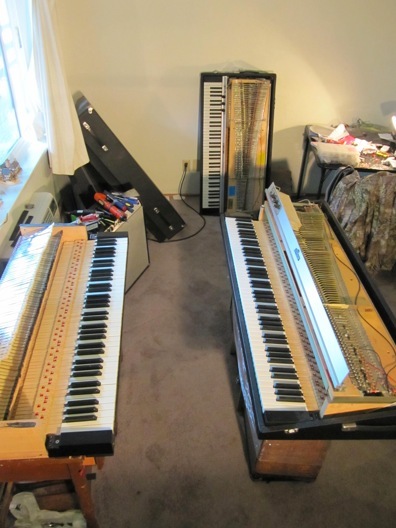 Here’s the 88 (on the right) next to a couple other Rhodes that David is currently restoring.